As the chants of “We Want Bama” reverberated through the entranceways of Vaught-Hemingway stadium, the stage was set for a mighty Mississippi charge against the top ranked Crimson Tide. The 2-0 Rebels believed that they could be victorious. After the very first play of the game, they were on their way. Jordan Ta’amu found D.K. Metcalf down sideline and tiptoed his way into the end zone and suddenly Alabama trailed 7-0. In hindsight, maybe the fans should have stormed the field at the time. Unfortunately for the home team, everything went downhill after that. Actually, this game was beyond ugly. Alabama destroyed Ole Miss by a score 62-7. Tagovailoa finished the game with 47 yards rushing and 191 in the air with two touchdowns. 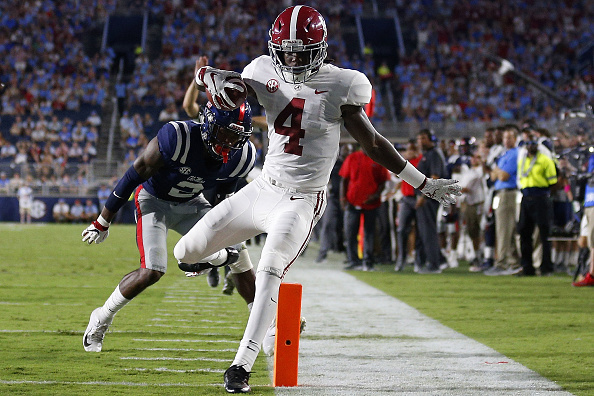 Jerry Jeudy caught a touchdown pass for both Tagovailoa and Jalen Hurts. This was the third consecutive multiple touchdown game for Jeudy. “The offense is real dynamic. Having three receivers that can play all positions, and they know them all really well, plus having the young guys step in helps the team a lot,” Jeudy said. On defense, the Crimson Tide held the Rebels to 248 total yards and forced three turnovers. One of those was a huge pick six by Xavier McKinney. “We were confident in our game and the way we play. They were great receivers and got open, they were physical, but I feel like we prepared well,” said McKinney.